Hi guys! 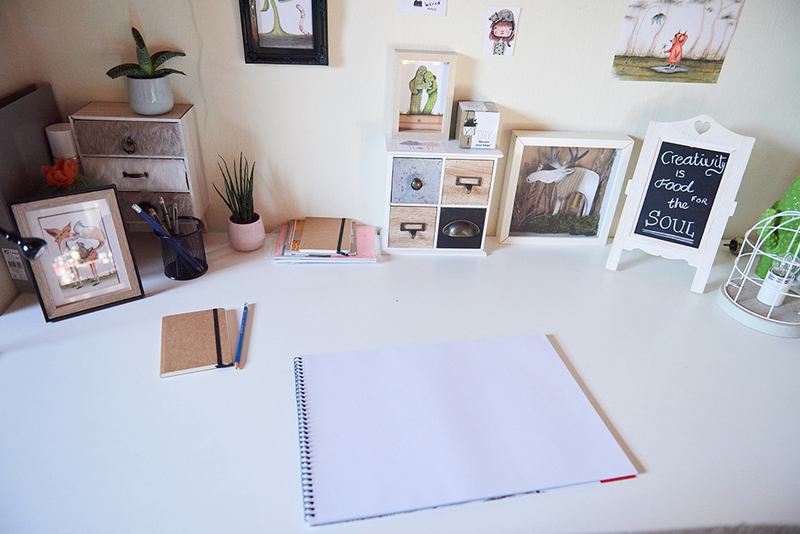 I wanted to do a quick little studio tour since I recently gave it a makeover! I had a perfect space available up in our attic, and a perfect desk to work on but it wasn't cozy, and it wasn't giving me any inspiration and excitement to start my work day. So, I went and spent $30 and bought cute little decor items that make me happy. I'm really happy with how it turned out and it shows you don't need to spend a lot of money to make your workspace look really nice! Since I'm in love with everything boho and vintage, I kinda combined the two, and added my own art to give it a personal touch. I have all my materials in little drawers that I can easily access while I work and two lamps that give me enough light to also work at night. I'm doing a video studio tour next week so stay tuned for that on my youtube page! For now I'll share these photos of my new workspace!